For financial advisors, a winning day can come in many forms—a good day in the market, signing a new client or shooting par for a round of golf. But with each of these wins, except for maybe the golf, come tedious paperwork, mailing and filing. Take new client onboarding for example. Your advisor wins the client, but now he has to go fill out a new account form, make sure that everything is in order, mail it out for a signature, wait for it to come back and go through compliance reviews and approvals. Then if he’s lucky and everything was done right the first time, you can file the form away in a place where it won’t get lost—or maybe even scan it to your network if you’ve realized the cost benefits of going paperless (although you should be careful with this method, as simply storing your documents on a network drive usually falls out of line with SEC and FINRA compliance regulations). All of this work doesn’t just cost your advisor time that could be spent building more client relationships—it also makes the experience more difficult for the client. With the implementation of a workflow and document management solution, this process can be automated and streamlined in such a way that you, your advisor and the client never need to touch a piece of paper. If these tools are integrated with CRM, forms filling and electronic signature software, the client onboarding process can be turned into something that takes your advisor minutes to complete and leaves his new clients feeling confident in their financial advisor. It’s like walking onto a course and finding that the golf carts are all outfitted with GPS—it’s just a good first impression. 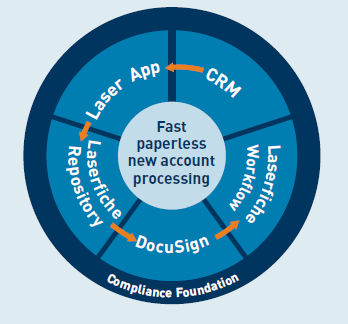 Client onboarding is just one of the paper-intensive processes that broker dealers can automate using technology. Check logs, filing and naming, compliance review and client reporting also present opportunities for paperless processing. If you are interested in how technology can help financial advisors, a workshop is being offered on two separate dates, once in Boston and again in New York City. In this workshop, Amy Flourry, Senior Operations Manager at Rehmann Financial, will outline how her firm has automated account opening and compliance approval processes. Tim Welsh, President of Nexus Strategy LLC, will also cover industry trends and the ROI that can be found through technology implementations. Want to see how a full-service broker dealer automates account opening? Check out our Girard Securities case study!